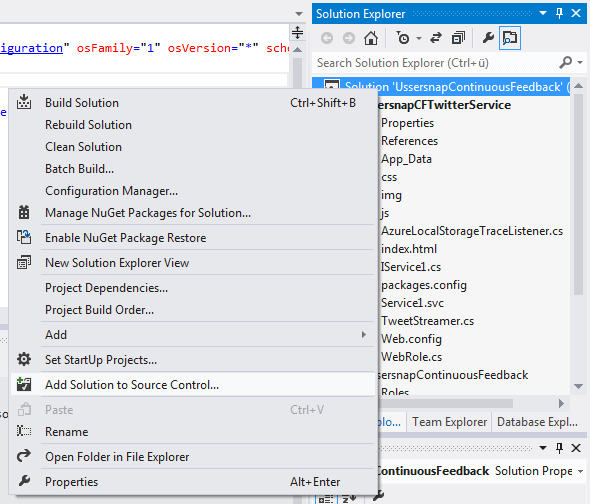 Before we start, please make sure to either have a recent version of Visual Studio installed. 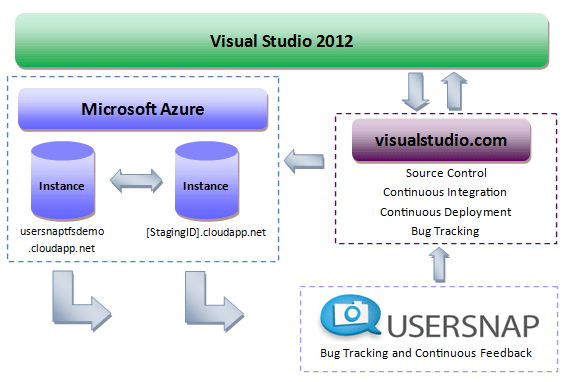 – alternatively you may download Visual Studio Express 2012 for Web with Windows Azure SDK (V11.0.507727 from Oct, 26 2012). 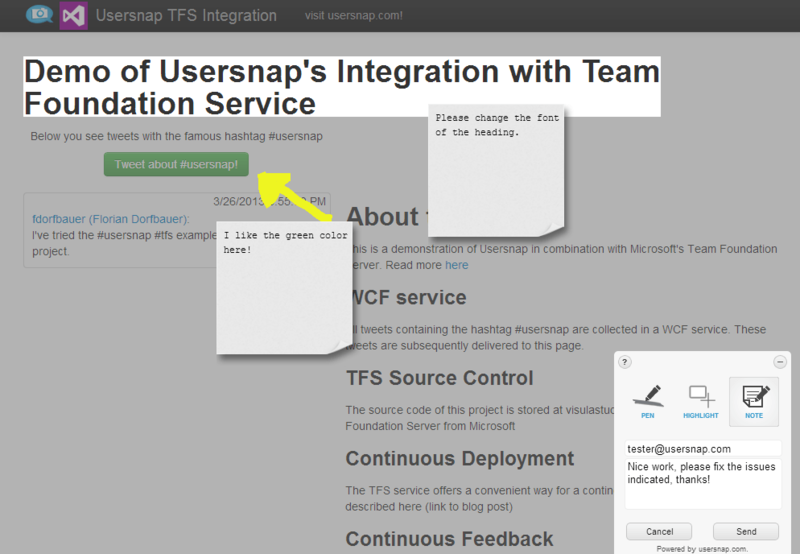 Then get the Usersnap TFS Demo code: Usersnap TFS Tweet Wall Demo. Open the solution, build and run it – a browser should start displaying the demo application – a tweet wall which displays recent tweets about Usersnap. 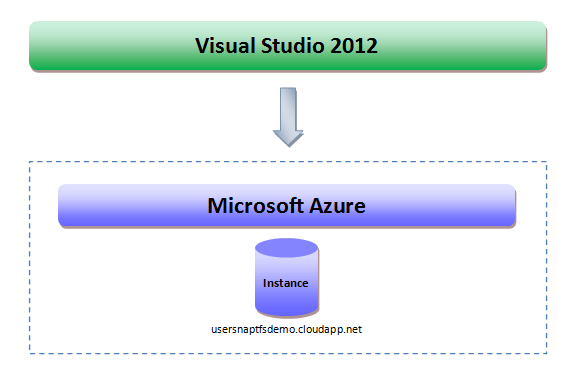 Since we want to deploy this application in Azure, we need an Azure account. 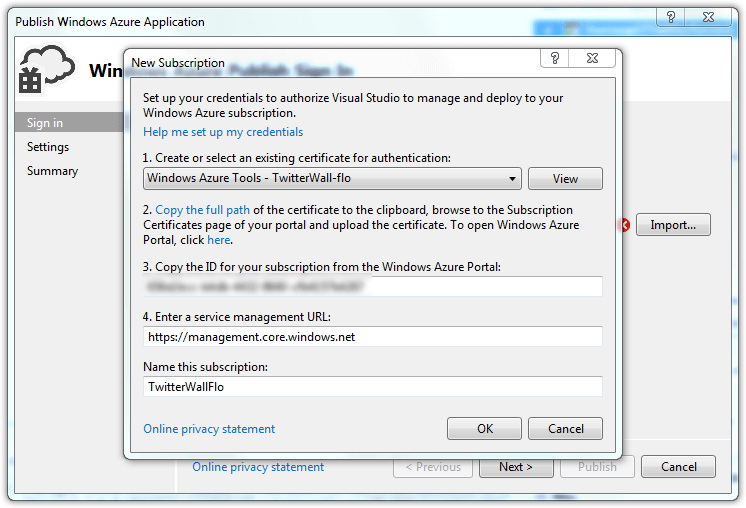 You can sign up for a Windows Azure Account here: http://www.windowsazure.com – there is a free 90 day trial available. 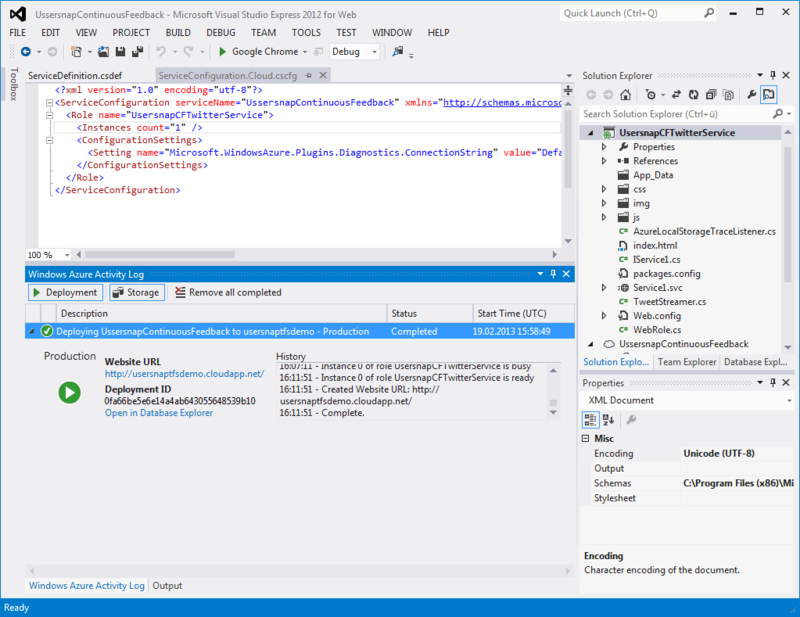 Next, you need to connect your Visual Studio project with Azure. 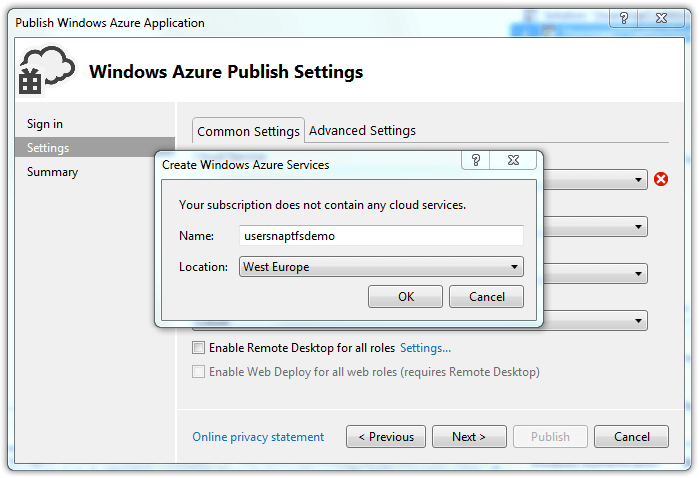 Right-click on your project and choose “Publish to Windows Azure…”. Upload the certificate from step 2. 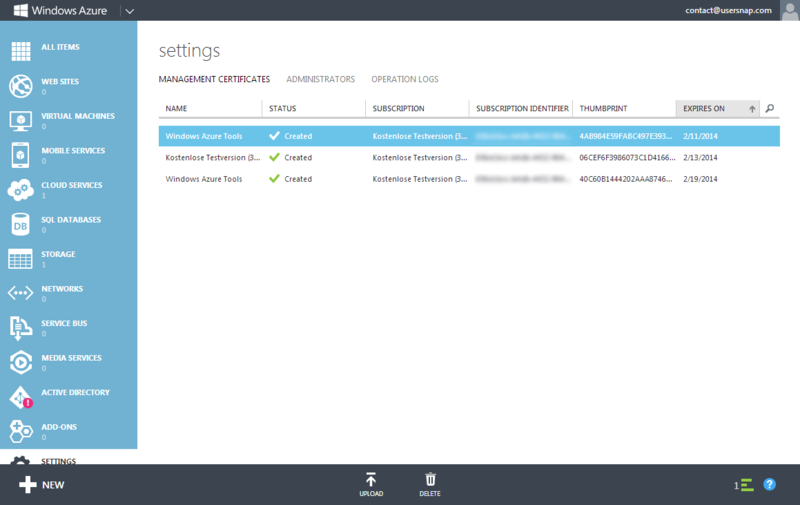 (“Copy the full path”) in your Azure Management Console under “Settings” – “Management Certificates”. 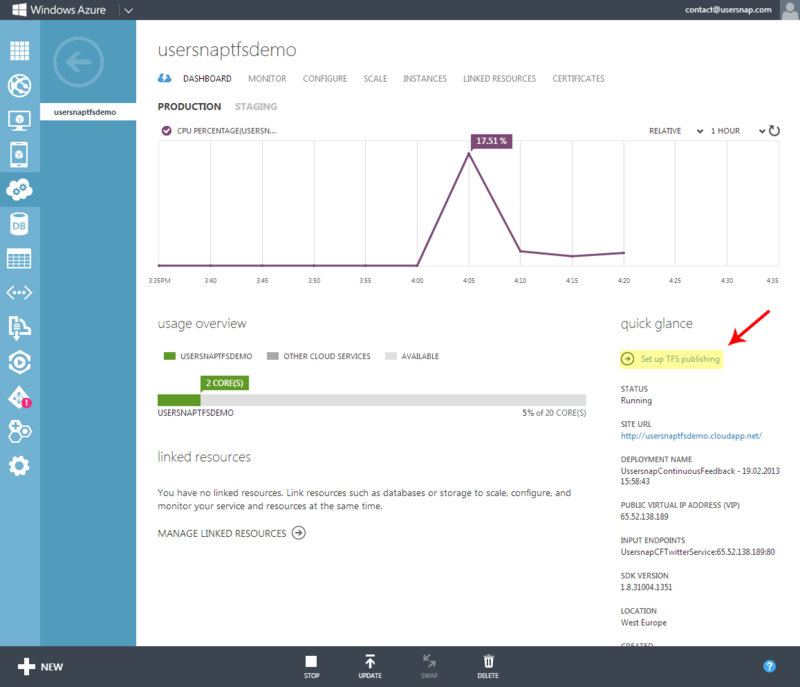 Then you need to set up your Azure subscription details, the subscription ID can be found in your Azure management console: Windows Azure Management. After that, you will be asked to specify a cloud service. Choose a meaningful name and a location – the name will be used as deployment domain URL. Now you are ready to deploy your WCF application to Azure – simply start the publish process to Azure and wait a couple of minutes. Right now, the source code resides locally, no source control management features are available. 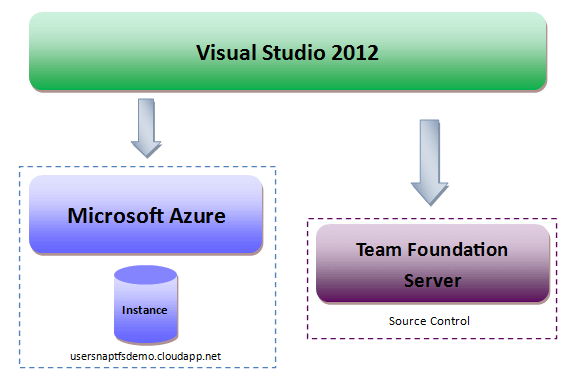 We will now utilize Microsoft’s new online version of Team Foundation server (TFS). 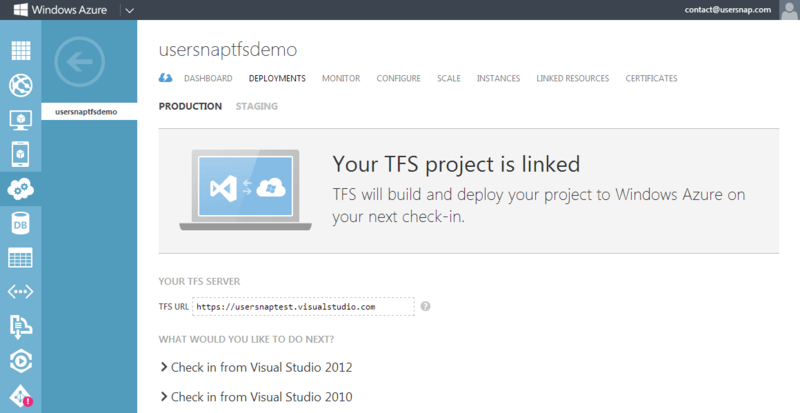 You can sign up for a TFS account here and you will get your very own TFS online instance (sign up here: https://tfs.visualstudio.com). 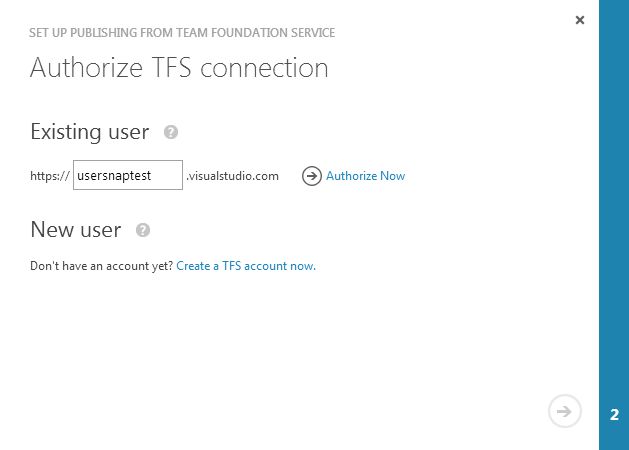 You may use TFS online for up to 5 team members for free. Create a project (e.g. 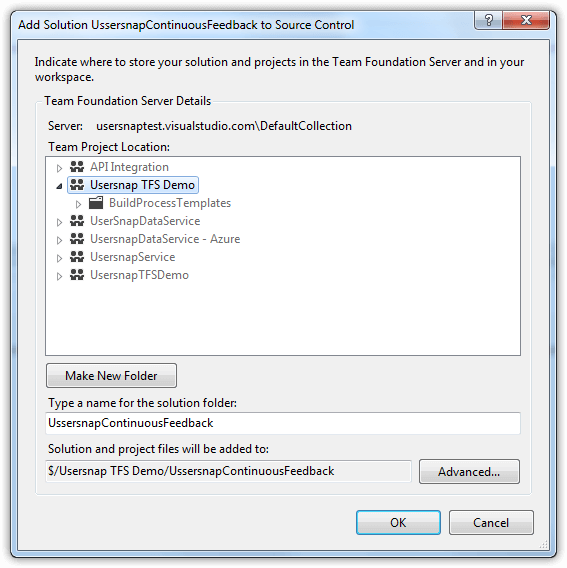 Usersnap TFS Demo) and choose your favorite process template. 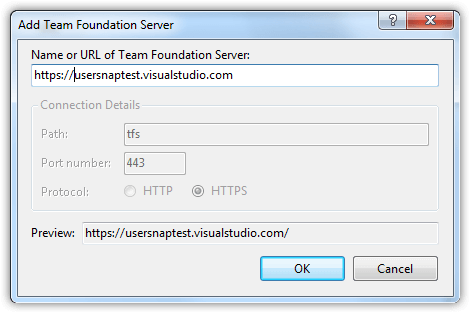 Add a new Team Foundation server and enter your TFS URL (don’t forget it’s https!). 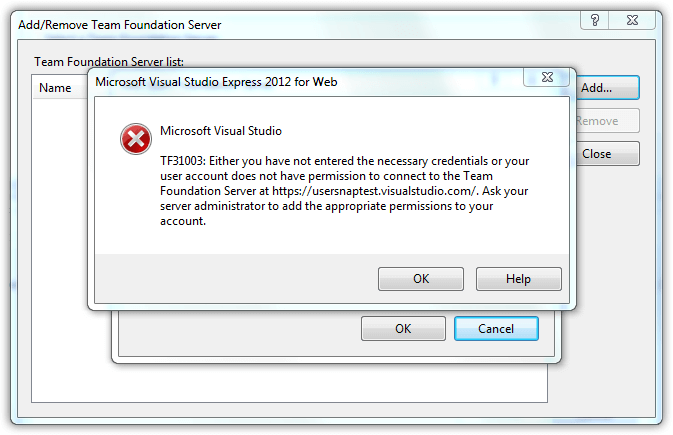 We ran into an error while connecting to our specified Team Foundation Server, because Visual Studio uses the Internet Explorer to authenticate you. If the current user in Internet Explorer is different from the user you’ve used to set up TFS you need to start Internet Explorer and log out the other account used there. If this doesn’t work, clear Internet Explorers’ Cookies. Now let’s push some code to our TFS online instance – Click on “Pending Changes” in your Team Explorer, add a meaningful commit comment and hit “Check In”. 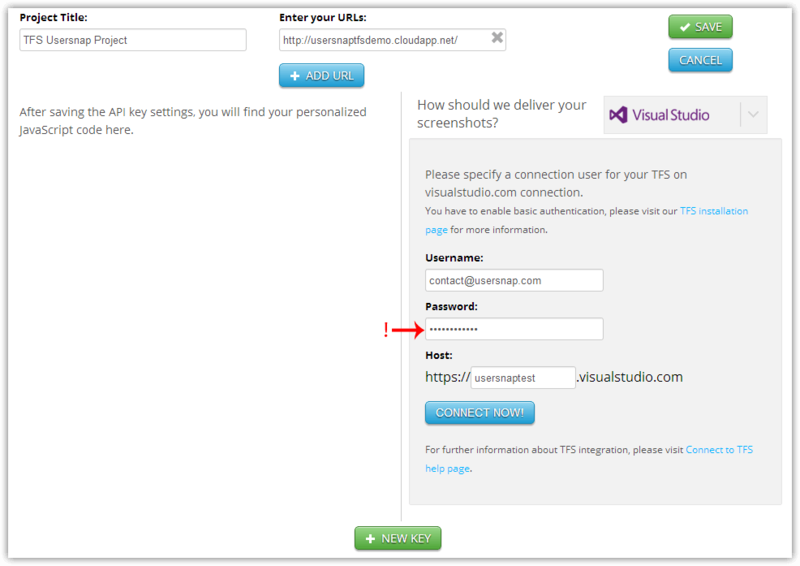 Your source code will now be transfered to your TFS online instance. Great, isn’t it? 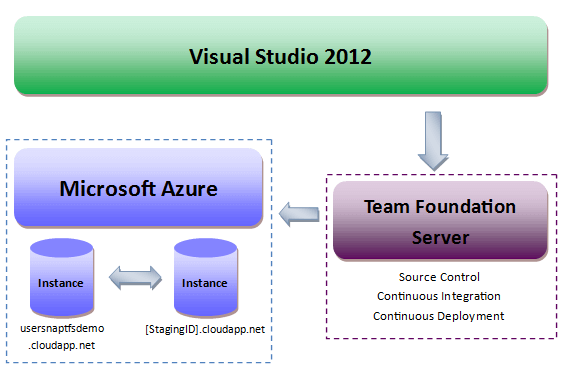 By now, publishing to the Azure Cloud and pushing code to TFS online are two separate processes. 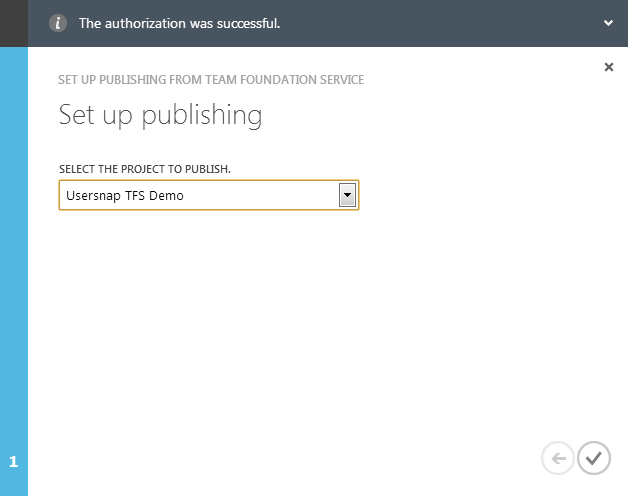 In this step, we will connect TFS with Microsoft Azure – log in to your Azure Management console, select the instance of your project and click on “Set up TFS publishing” as indicated below. 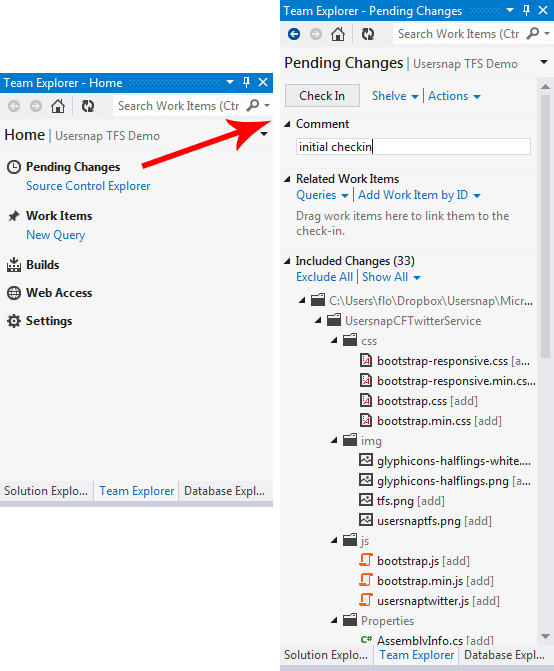 Now let’s use the complete chain: Add some code changes in Visual Studio and commit the changes to TFS online – what happens now is, that your code is being built by TFS online and subsequently pushed to your staging instance. 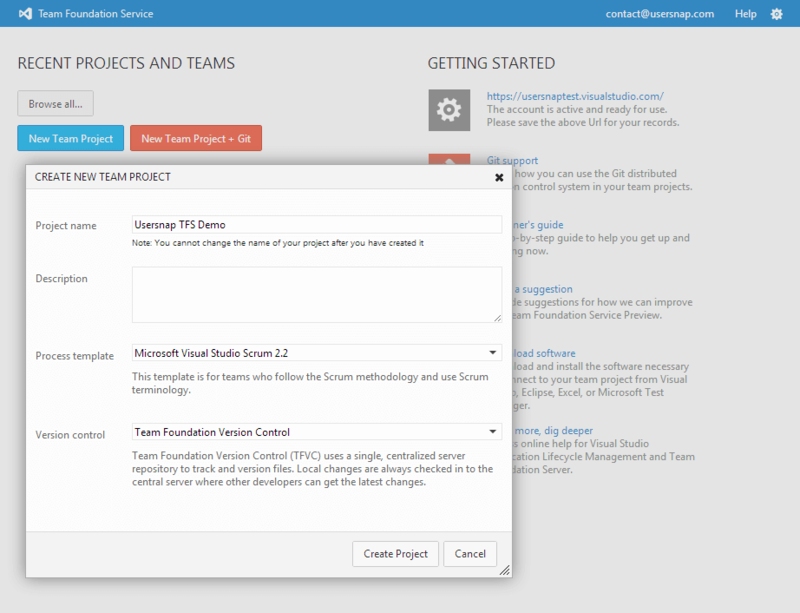 You can watch this process in Visual Studio by clicking “Home” – “Builds” in your Team Explorer. If you like your changes, swap both, production and staging instances in your “Azure Management Console” and with just a single commit you successfully deployed your changes. 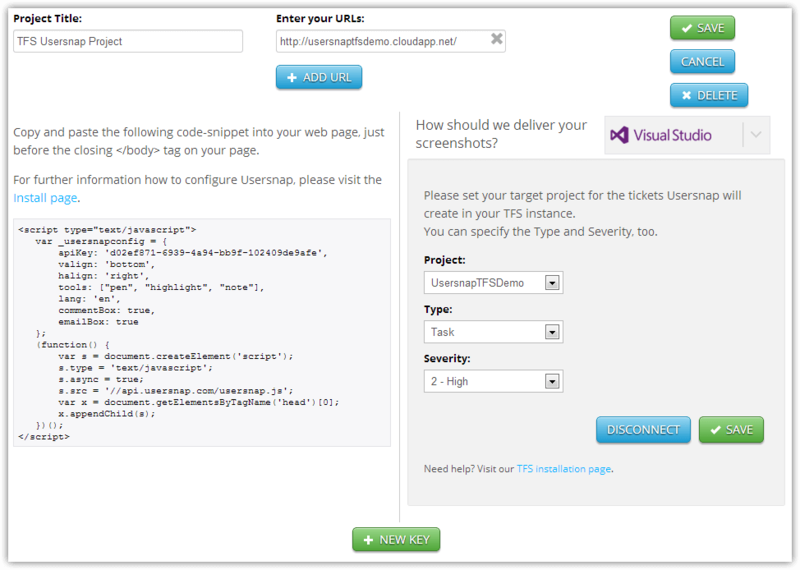 Usersnap can be extensively configured, more information can be found here. For now, just add some remarks and click “Send”. A screenshot of this situation will be created and transfered to your selected TFS online backlog list, including meta information such as the used browser and the used operating system. This is specifically useful, when it comes to browser related bugs. The good news here is that the person who reports a bug or gives feedback can be done by anybody, without installing any tool locally. This essentially enables you to get feedback from your stakeholders, visitors or customers continuously. In TFS you can conveniently examine all reports, change the severity and assign your tickets. In case you need to get in touch with the person sending the report, the sender’s email adress is also present. A closed loop between real users, product development and software development is an effective method to continuously improve and grow a product in a rapid pace. 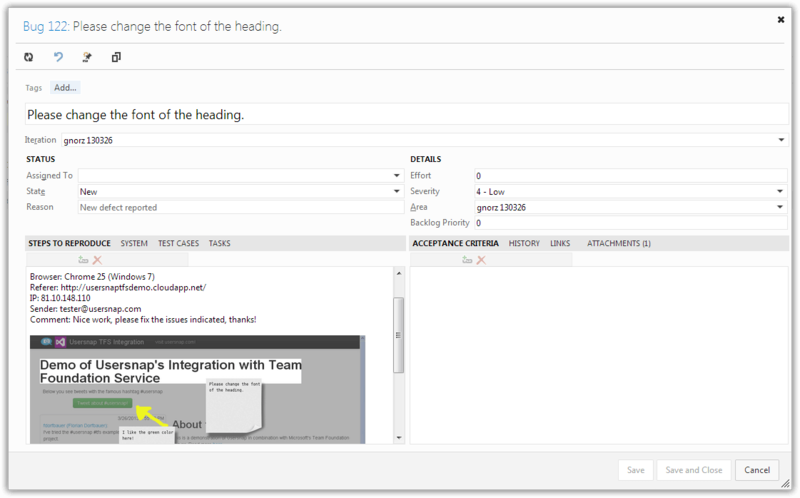 The required tools to set up a 3C chain (Continuous Integration, Continuous Deployment and Continuous Feedback) are available today and easy to set up – Microsoft’s tools are well aligned and even allows to integrate Continuous Feedback with Usersnap. Just give it a try! If you have any questions: we’re always happy to help – just leave a comment below or simply send us a tweet here: http://usersnaptfsdemo.cloudapp.net.